NASA/JPL needed a dynamic test bed for the Space Interferometry Mission (SIM) to demonstrate spacecraft vibration-induced errors of a few nanometers. Top researchers at over 200 leading universities and government labs have selected Minus K products to achieve the superior vibration control needed in their projects! 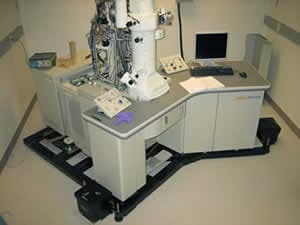 The University of Texas Center for Learning and Memory's transmission electron microscope (TEM) uses a custom Minus K negative-stiffness isolation platform. 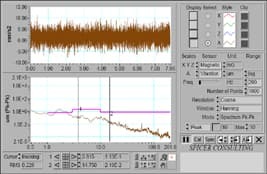 The measurements below show the 1.2 to 2.5-Hz horizontal vibrations the equipment experienced in the fifth-floor lab before (left) and after (right) isolation with a 0.4-Hz negative-stiffness system. 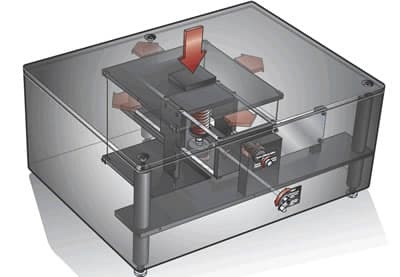 New CT-1 Ultra-Thin Low-Height, Vibration Isolation Platform at just 2-1/4 inches in height. Minus K is an OEM supplier to leading manufacturers of SPMs, microhardness testers, NSOMs and profilers.